These days, there are many ways for nonprofit organizations to raise money. There are peer-to-peer campaigns, fundraising galas, special events, and many more options. But when you sort through all of these creative ideas, there is one that stands out – matching gifts. Matching gifts are the ticket to boosting your fundraising revenue throughout the entire year. In fact, you can utilize matching gifts together with all of the fundraising ideas above. Or you can prioritize matching gifts on their own. Matching gifts are donations made to a nonprofit by a company whose employee has already donated to. Donorbox has already compiled everything you need to know about matching gift programs. The concept of matching gifts is simple. But beyond this general idea, there are a number of elements that make up each company’s program. Each company sets its own guidelines. And if you’re thinking that your organization doesn’t need to bother with this, think again. $4-7 billion in matching gift revenue is unclaimed each year. We want to help you claim it. Each matching gift program will always outline exactly what size donation qualifies for a match. Any donation that is less than the minimum does not qualify for a match. On the other hand, a donation that surpasses the maximum will be matched up to that maximum amount. The match ratio indicates how much a company will donate in relation to the value of the original donation. A 1:1 match means that the employer will match the employee’s donation dollar-for-dollar. Some programs will specify different minimum, maximums, or match ratios for employees at different levels. For example, Soros Fund Management LLC offers a 3:1 match for full-time employees. Partners get a 2:1 ratio. Other companies offer different ratios for retirees. The nonprofit itself can also affect the parameters. For Example, ExxonMobil offers a 3:1 match for donations made to educational institutions. Donations to arts and cultural organizations get a 1:1 match. Some programs specify a certain date (the last day of the year and Tax Day are popular choices). Others allow for a certain window period, dependent on when the donation was made (90 days following the original donation). In contrast to the somewhat arbitrary elements described above, the process for actually collecting matching gifts is always exactly the same. A donation must be made to set off the matching gift process. That being said, mentioning matching gifts in your fundraising appeals increases response rates by 71%. So it could be argued that mentioning matching gifts is actually the first step, but we’ll talk more about that later. After a donation is made, the donor must submit a matching gift request to their employer. The recipient of the donation can not request a matching gift – the donor has to do it. This second step is where the process most often breaks down. This breakdown in the process is due simply to lack of awareness. Donors have often never heard of matching gifts and therefore don’t realize that they’d need to request one from their employer. Next, you need a company review of the matching gift request. Companies tend to have a matching gifts agent (or even a whole team) whose job is to field these requests and determine which ones qualify for a match. Once a match request has been proven to meet all of the company-set standards, the company’s matching gift agent will confirm with the nonprofit that the initial donation was made as reported. From there, all that’s left is for the nonprofit to receive the matching gift from the initial donor’s employer. That process is the same for every company and nonprofit. 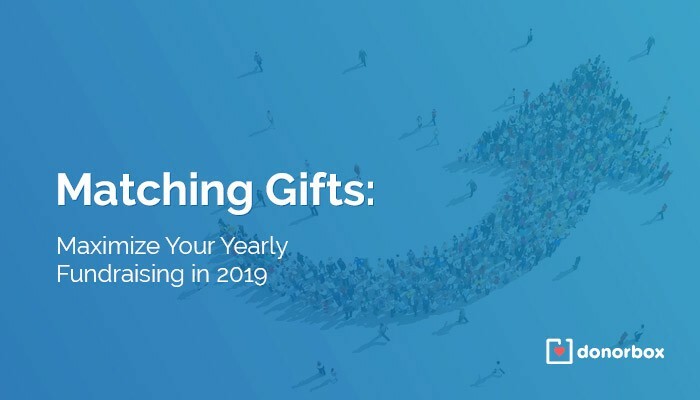 Now that you know what matching gifts are, how the company’s design their guidelines, and what the process for collecting them is, let’s talk about how to increase matching gift revenue in the new year! Matching gifts are still collectable long past the moment an eligible donation is made. As we mentioned in the section above, many companies set their matching gift deadlines beyond the last day of the year. It is very common to see deadlines set at one year past the donation, 90 days past, or even Tax Day of the following year. This means that there are still plenty of matching gifts to be claimed from 2018! As you plan your fundraising goals for the new year, factor in some time and energy to track down unclaimed matching gifts. Did you know that Donorbox offers matching gift features that can simplify the process for you? It’s true! When your matching gift functionality is turned on, Donorbox notifies you every time a match-eligible donation is made. Your organization should certainly implement this. Then you can spend the first few weeks of the new year gathering those notifications and following up with donors. We highly recommend taking to social media. Encourage your audience to start the year off right by researching whether their employer offers matching gifts. 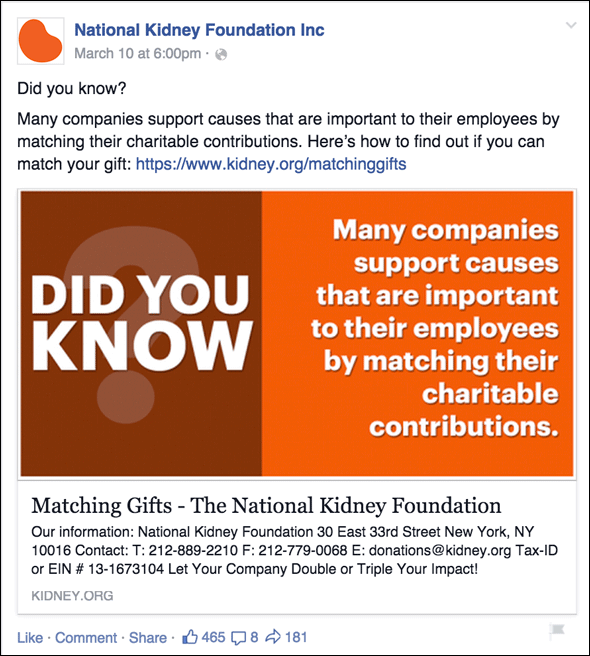 Check out a few examples of effective social media posts about matching gifts. Notice how these organizations let their audiences know about matching gifts. Plus, they take it a step further and offer a way for people to check their own match-eligibility. In addition to collecting last year’s matching gifts, it’s important to prioritize matching gifts for the upcoming year. Matching gifts offer an incredible opportunity once a donation has been made. Supporters become donors. 84% of people said that they were more likely to donate if matching gifts are offered. Every organization and educational institution should have a dedicated web page to educate their audience about matching gifts. This page should have a simple and clear explanation of what matching gifts are. It should also include a matching gift search tool or an extensive list of companies that offer matching gift programs. You should include a link to this page in your main navigation bar. Emails are a great way to speak directly to your established donor base and extended audience. You can use this platform to spread information about matching gifts. In fact, you can use this email to explain what matching gifts are. Then link to your dedicated matching gifts page so that your potential donors can check their match-eligibility. Did you know that 86% of heads of household still sort through their physical mail? That percentage is unheard of in this day and age, so we say take advantage of any attention you can grab. Send mailers that quickly describe what matching gifts are. Encourage the reader to visit your matching gifts page to learn more. Our recommendations are not mutually exclusive. Just mentioning matching gifts results in a 51% increase in the average donation amount. So, we suggest mentioning matching gifts in every single place that you can think of. The final recommendation we have for you is this: harness the power of matching gift software. As a Donorbox customer, it is so easy. Donorbox has partnered with Double the Donation to make sure that every matching gift opportunity is ceased. This integration is easily turned on through your Donorbox account. Once enabled, your donors will be presented with matching gift information after every transaction. Immediately after the donor selects their donation amount, they are asked to name their employer. Then they are directed to a hosted matching gift page where they are shown their company-specific matching gift information. 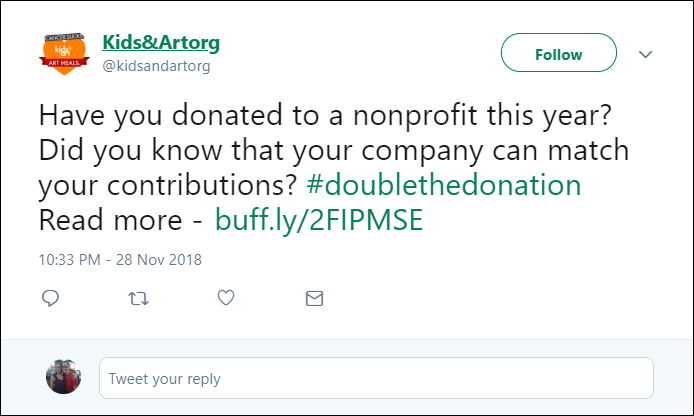 Additionally, Donorbox will send your organization a notification about the donor who selected a company for gift-matching. This functionality utilizes Double the Donation’s extensive matching gift database. This includes over 20,000 companies, subsidiaries, and even spelling variations. This ensures that not a single matching gift opportunity slips through the cracks. Matching gifts are the revenue boost that your organization can be taking advantage of all year long. The biggest obstacle to collecting this revenue is the donors’ lack of awareness. So, get out there and start spreading the word about matching gifts.